Last week, I shared this Wet Burrito recipe on my Facebook page and mentioned I was trying out the recipe for dinner. This recipe sounded WAY too complicated and they were wondering why I would promote such a difficult recipe. They were miffed by the fact that this recipe called for “canned gravy” and “canned enchilada sauce” which are processed foods. This really was NOT a difficult recipe at all. …I’m happy to say that WE gave it two thumbs up! It was delicious, and I will definitely be making it again in the future… especially since I came up with a few different ways to simplify the ingredients and the over-all cooking process! If you’re looking for a really good Wet Burrito recipe that can be made ahead of time and will feed the whole family, I’d highly suggest giving this one a try! Optional toppings = sour cream, chopped onion, chopped tomatoes, lettuce, and salsa. 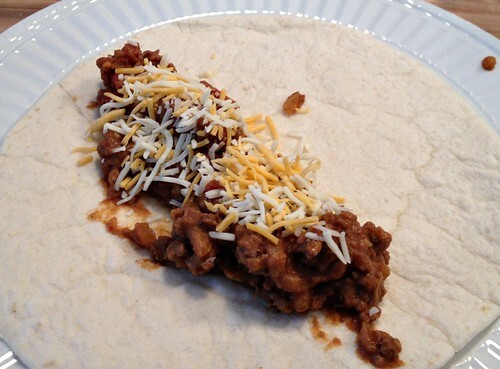 Assemble the burritos by spooning a few Tablespoons of meat/bean mixture into each tortilla and top with shredded cheese. Roll up and place seam-side down in a greased 9″ x 13″ pan. Serve with optional toppings, tortilla chips, and extra salsa! I know it might still seem like a longer list of ingredients — but I promise, it was VERY simple to make. In fact, since I always have containers of cooked ground beef in the freezer, I was able to eliminate the first step of cooking the meat and I literally had the whole recipe ready for the oven in about 20 minutes. Then I cleaned up the kitchen, set the table, and prepared the optional toppings while it baked for the 15-20 minutes (basically just to melt the cheese). So I essentially had dinner on the table AND the entire kitchen cleaned up in about 45 minutes — not bad! If you want to make this recipe the day ahead (or the morning of) you’ll probably just need to cook it for a bit longer since it will be cold when you’re putting it in the oven. 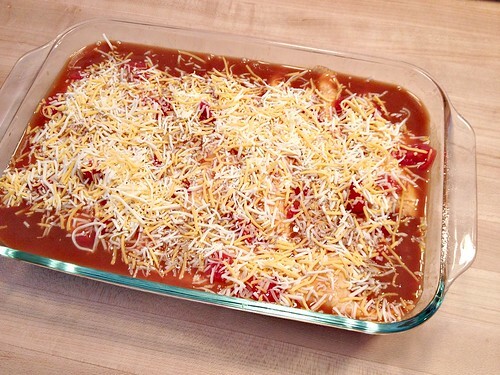 If you want to freeze this recipe, I’d personally freeze the plain burritos without the sauce, then I’d add the sauce and cheese right before baking. If you’re not into processed foods, simply make your own gravy, make your own enchilada sauce, and use the spice mixture I listed above instead of the pre-packaged spices. Also, you could try using ground turkey or even shredded chicken in place of the ground beef. I’m guessing you could even make this vegetarian by doubling the refried beans and maybe adding some whole black beans as well. Like I mentioned above, Dave and I both gave this recipe 2 thumbs up and I’ll definitely be making it again! What are your favorite make-ahead Mexican meals? Sometimes processed foods can save the day. I’m not saying to use everything, but I do keep a few products in my pantry for those moments when you need something quickly. A couple of cans of gravy, a small box of instant potatoes (they make a great thickener for soups or stews), or if you need an extra hand when people drop by unexpectedly. While it’s not something I use on a daily or even a weekly basis, I have gone to my “emergency” stash from time to time. oh yes, definitely!! 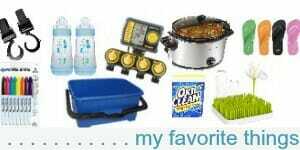 I always have a few “back up” items in the pantry and we always have at least one frozen pizza in the freezer for busy weeks, unexpected company, etc. etc. This sounds like the “Beltline Bar” Wet Burrito recipe. YUM! Ah, the joy of social media…everyone gets to share their opinions. 🙂 Sounds yummy to me. Unfortunately with my picky eaters, I’d be eating it alone. I have never made gravy before. How did you make yours? This looks so yummy, can’t wait to try it soon. Thanks for sharing it with us!! Thanks Deann — this recipe is great! Oh, and gravy is really easy — just meat broth and some thickening agent like flour or cornstarch. Whisk the thickener into the broth and keep whisking over medium heat until it thickens. Add more broth or water if it’s too thick, add more flour or cornstarch if it’s too thin. 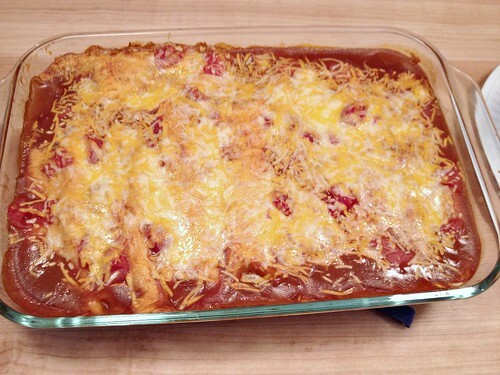 I made this a few months ago, giggling at the “wet” name, as we live in Arizona, so we just call these enchiladas….They were delicious! One of my faves-thanks! I made these a few nights ago and they were DELICIOUS! Also, not difficult or time consuming at all. I started COOKING at 4:55pm and we were done EATING by 6:02pm…..that seems pretty quick to me! And I even made the gravy! Thanks for sharing the recipe! I made this for dinner tonight. It was really good and super-duper easy. I am going over and pin to my “I Did This!” board. Thank you so much for sharing this recipe. Just tried your recipe tonight and it was wonderful. 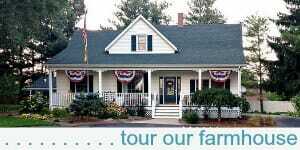 We all loved it! Adding this to my “mexican theme” section on my menu. Thank you for sharing. I am never disappointed trying your recipes. 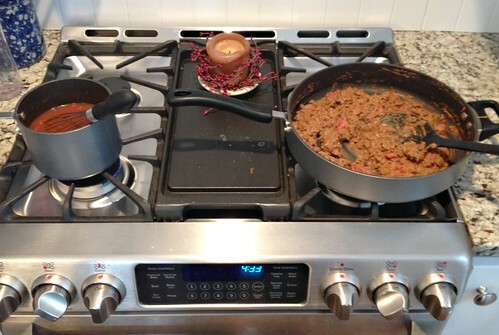 My hubby isn’t a fan of refried beans, but I’ve never tried cooking them in with the meat. Do you think they have a strong bean flavor, or does the bean mixture mask them a bit? Thanks again…I will definitely be making this real soon! Why do people have strong principles about canned or processed foods but not strong principles on not offending others? If you find it difficult and not suitable for you, you just don’t make it! Sometimes, I don’t understand the need to have an opinion on everything, eventhough it doesn’t help anyone. 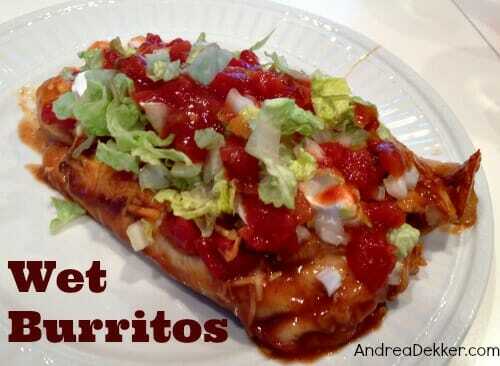 I like this recipe and I would really try it if burrito wraps weren’t so expensive in my country! 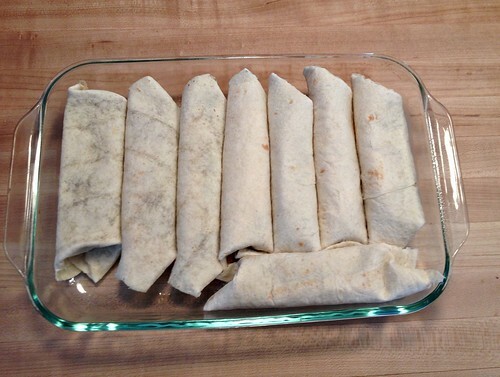 You can make your own wraps with flour, water, salt and baking soda (? )/powder (?). My daughter learned how when she lived in Honduras. I am sure you could google it! I haven’t made these with ground beef but I have made them with chicken. For the sauce, I use 1C of chicken broth, 1/2 C salsa and 1/4C sour cream. I would probably use beef broth if I was going to make the ground beef version. Maybe some dear people just like to gripe. Bless their hearts they need to get a grip on what’s really important. 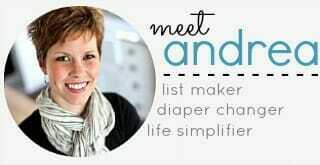 And bless your heart, Andrea, for all you give us on your blog. When I see a recipe in a book, or in a magazine, or somewhere on the net, e.g. blogs, and I don’t like something about the said recipe, THEN I SIMPLY DON’T USE IT! My family has never been fans of burritos, but I’m willing to try your recipe. And I love your philosophy of making “nearly made from scratch food” part of the time. It’s ok to use canned sauce, gravy, soup, etc. even though they are processed foods. If one doesn’t like the processed idea, then it’s time to make theirs from scratch! Keep your recipes coming, Andrea. I love ’em! Keep your chin up! Some irregular people must complain about something! 🙂 That looks so good I could put my face in it. Don’t fret over a few negative comments. They can be helpful or hurtful. Take them in stride. These do look delicious. Far too much sodium for me so I can’t try them, but I think they would be delicious. Hi! Im a mexican girl. And this recipe looks delicious, but is not a mexican recipe or mexican food at all. 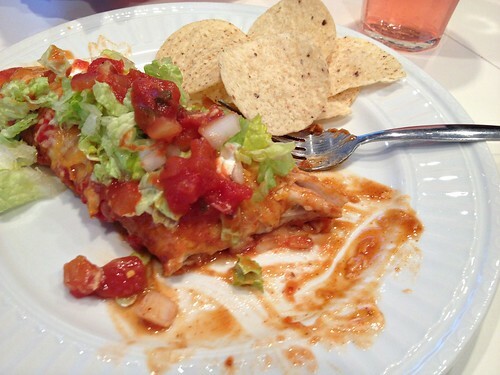 It looks like enchilada, but, a great diference is enchiladas are made by tortillas de maiz not flour tortillas, and there are not here any food, enchilada o burrito, made by brown gravy or Worcestershire suace. I think this is an enterely american recipe. Not mexican at ALL! Greetings for your new baby born. 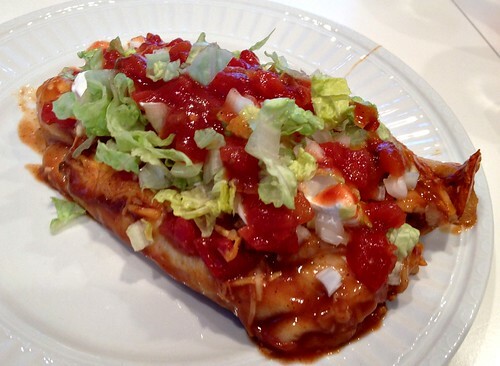 I am from Southwest Missouri and we call this “Burritos Enchilada Style”. It is a staple at restaurants around here. I have never heard of “Wet Burritos”. Funny how, depending on which part of the country you are in, things can have different names for the same thing. Looking at this makes me hungry, glad that tonight is Mexican night at my house! This looks delicious and easy!! Thanks for the inspiration!! Ohhh, this looks yummy! And not too hard to make either. I LOVE Mexican food, but usually only eat it out at restaurants….so I’ll definitely have to try this one! I think I’ll use 2 smaller casserole dishes to split the recipe in 1/2 for our family. But the larger recipe would be perfect for parties. Thanks for sharing this! I don’t know what people’s problems are. If they don’t want to use processed foods, they don’t have to. They don’t need to be nasty. Not everyone has the time to make their own gravy or enchilada sauce. I buy can. One question about the burritos: because you are using flour tortillas, how is the texture of the tortilla after it is baked in the sauce? 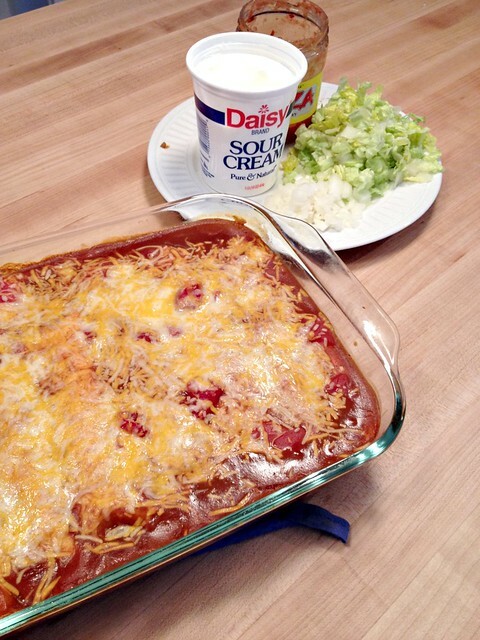 I had made a casserole once that required flour tortillas baked in sauce and the tortillas felt slimy after being cooked. It was super tasty, but my family had a problem with the texture. I made these the night you posted them and they were a big hit! Delicious! I did it the “hard” way, I guess, and I didn’t think it was bad at all. I am amazed at what people take offense at. If it’s too time consuming or you don’t like the ingredients, don’t make it! Doesn’t seem like a hard decision to me! I appreciate you sharing it! It was yummy! Hope you’re relaxing and snuggling that new baby boy! I <3 "semi-homemade", "processed" food! Almost as much as I love buzz words. Otherwise, I would never cook. I will be trying this!!! They look fabulous! I am adding this recipe to my “Mexican” day on the weekly theme menu. Love seeing your posts on food and how it can fit into the menu. Does not sound that difficult to me so I don’t know what all the fuss was about. The pictures look great and I think I’ll give it a try. I’m always a fan of the recipes you share.